JODIE Whittaker took over as the first female Doctor Who last night with the line: "Oh, brilliant!" The Broadchurch star, 35, was on screen for just a few minutes as she replaced Peter Capaldi, 59, as the Time Lord. The BBC One Christmas special also saw David Bradley, 75, appear as the First Doctor in a tribute to the late William Hartnell. APA 6th ed. : Hope, Hannah (2017-12-26). Look! 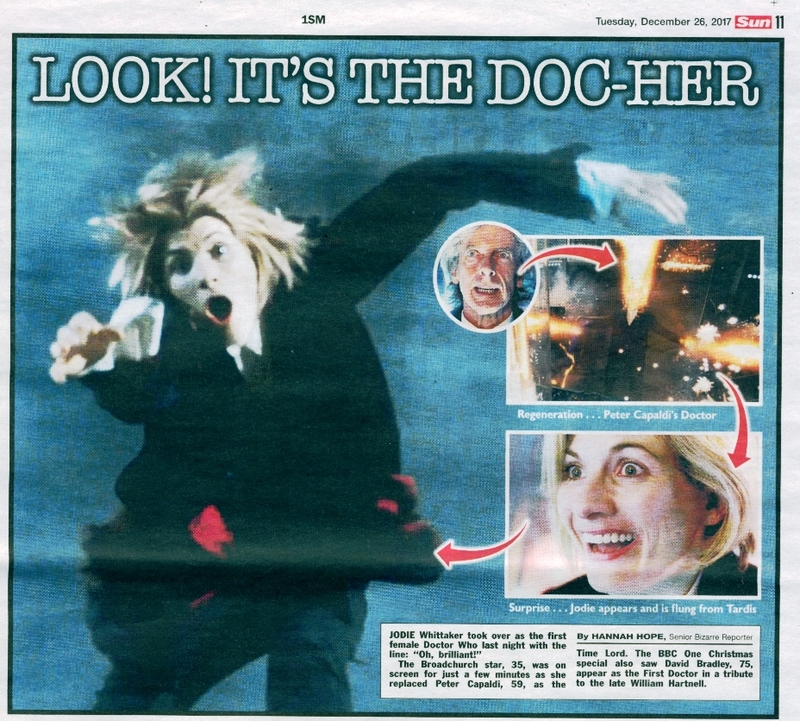 It's the Doc-Her. The Sun p. 11. MLA 7th ed. : Hope, Hannah. "Look! It's the Doc-Her." The Sun [add city] 2017-12-26, 11. Print. Turabian: Hope, Hannah. "Look! It's the Doc-Her." The Sun, 2017-12-26, section, 11 edition. This page was last modified on 1 April 2019, at 02:44.